Initialization hooks to configure common OpenVPN™ deployments such as server, gateway and client profiles. All profiles support SSL/TLS certificates for authentication and key exchange. Server and gateway deployments include a convenience script to add clients, generating all required keys and certificates, as well as a unified ovpn profile for clients to easily connect to the VPN. Expiring obfuscated HTTPS urls can be created for clients to download their profiles (especially useful with mobile devices using a QR code scanner). The server profile supports a private subnet configuration, enabling clients to reach servers behind the OpenVPN™ server. The gateway profile configures connecting clients to tunnel all their traffic through the VPN. When adding clients in a server or gateway deployment, an optional parameter can be given to enable computers on a subnet behind the client to connect to the VPN. For added security, OpenVPN™ is configured to drop privileges, run in a chroot jail dedicated to CRL, and uses tls-auth for HMAC signature verification protecting against DoS attacks, port flooding, port scanning and buffer overflow vulnerabilities in the SSL/TLS implementation. See the Usage documentation for further details, including Amazon VPC notes and cloudformation template. 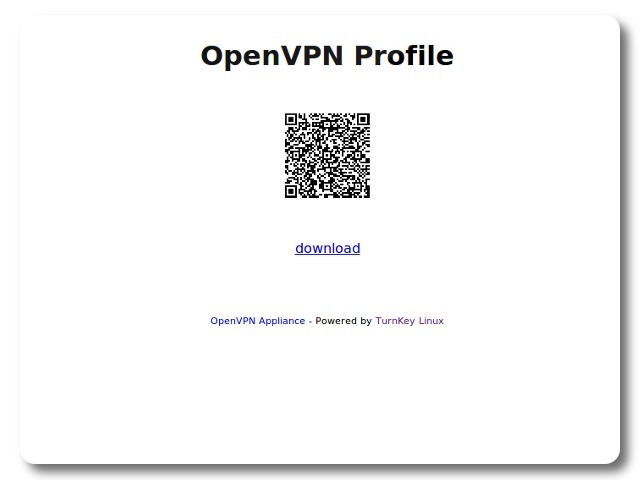 Note: OpenVPN™ is a registered trademark of OpenVPN™ Technologies, Inc. This software appliance is not supported by OpenVPN™ Technologies, Inc.